One of the things you have to determine early in the process of becoming a first time restaurant owner is the price points for your menu. For one thing, knowing how much money you plan to charge helps you determine how much you will make, which is essential for budgeting. For another thing, determining your price points will help you decide what dishes will be on your menu, which will determine what restaurant equipment you need and more. So here are One Fat Frog’s tips on how to determine the menu prices for your restaurant startup. First of all, you don’t need to decide what every dish is going to cost yet. You only need to determine the price points. For example, you need to know that your lunch sandwich menu will be from $4.99 to $7.99 and your dinner entrees will range from $9.99 to $12.99. You do not necessarily need to know that your smoked turkey sandwich will cost $5.95 this early in the process. 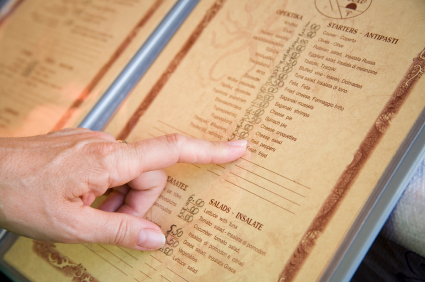 So how do you determine your restaurant menu’s price points? One major favor is the demographic of your diners. Where are you located and what is the socioeconomic class of that area? Do you want to be a casual dining restaurant or something more upscale? Is it more of a stop in for brunch place or a make reservations for dinner place? Are you counting on repeat regular business from the same people or getting occasional visits from many people? All of those help determine your menu price points. Another thing to consider is the prices of your competitors. You never notice that every fast food restaurant is priced basically the same? If the restaurants all offered basically the same product but one was cheaper than the rest, they would get all of the business. And a more expensive restaurant would go out of business. The same holds true for your restaurant. If you have competitors that offer the same type of food, look to see what they are charging. If you charge less, you can draw some of their customers away. If you charge more, though, there needs to be a reason for customers to pay more for your food. Maybe it’s because your food tastes better or maybe the atmosphere is better, but there has to be a reason. Speaking of atmosphere, that’s another factor. If this is a restaurant with plastic forks and an overall casual atmosphere, you probably can’t get away with charging $20 a plate. For that price, people have expectations of more elegance, with table cloths, cloth napkins, glasses of fine wine, etc. The most obvious factor in your menu pricing is the price you pay for those items. Lower prices can bring in customers, but if you lose money on each dish you sell, you can’t stay in business. The dishes that cost more to make will cost more and you compensate for that often by offering cheap alternatives. On the other hand, you may decide that you can’t serve a certain dish simply because you can’t charge enough to make money off of it. In that way, your price points also determine the content of your menu. As always, if you need help with your menu, look to your friends at One Fat Frog. In fact, bring us your best dishes and we will be happy to eat them and tell you how much we would be willing to pay for such a dish. The Frog is always working for you.